Any loss of life is a disaster to the families and friends of the deceased but if you compare the list of national disasters with that of our own local disasters you can see the North Derbyshire area did not suffer such great losses as did fellow miners in other areas. Between 1866 and 1919 a miner was killed every six hours, seriously inured every two hours and injured badly enough to need a week off work every two or three minutes. (1). The psychological impact of working in such a dangerous industry was incalculable. 'No man knows when he leaves his happy fireside in the morning but ere night he may be carried home a mangled corpse'. (2). (1). Mining days in Abram. F. Ridyard. p37. (Leigh. 1972). (2). Veritas' to the British Miner and General Newsman. (11th October 1862). National Accidents with over 100 lives lost. 1856. Cymmer, Rhonda, Glamorgan. 114. 1860. Black Vein, Risca, Monmouthshire. 142. 1862. New Hartley, Northumberland. 204. 1878. Wood Pit, Haydock, Lancashire. 189. 1880. Black Vein, Risca, Monmouthshire. 120. 1880. Naval Steam Coal, Penygraig, Glamorgan. 101. 1885. Clifton Hall, Lancashire. 178. 1892. Norths Park Slip, Tondu, Glamorgan. 112. 1894. Albian, Clifynydd, Glamorgan. 290. 1905. National, Wattstown, Glamorgan. 119. 1909. West Stanley, Durham. 168. 1913. Universal. Senghenydd, Glamorgan. 439. Local Accidents and Disasters. T.P.Woods Almanacs. 1861. Clay Cross Colliery. 11th June, mine flooded, twenty three lives lost. 1871. Rennishaw Park.10th January, explosion, twenty seven killed, twelve injured. 1882. Parkhouse Colliery. 7th November, explosion, forty five lives lost. 1895. A. Winning Colliery.11th. November, explosion, seven lives lost. 1911. Southgate Colliery.22nd November, cage accident, three killed, nine injured. 1913 Bolsover Colliery. Thirteen killed, five injured. 800 gallon bucket full of water came down shaft. 1919. Oxcroft Colliery. 6th April, six killed, seven injured. 1922. Whittington Opencast. 22nd June, 3 men gassed, two died. 1928. Wallsend Colliery. 10th January, explosion. 1933. Grassmoor Colliery. 19th November, explosion, fourteen killed, eight injured. 1935. Glapwell Colliery.10th September, six trapped, one died, three hospitalised. 1936. Glapwell Colliery No3.1st April, man rescued. 1937. Markham Nol Colliery. 21st January, explosion, nine lives lost. 1931. Winterbank Pit. 15th February, explosion, seven killed, four Injured, one died later. 1937. Turnoak Colliery. 10th October, seven boys injured after throwing a firework down the shaft. 1938. Markham Nol Colliery.10th May, explosion seventy nine lives Lost, thirty eight injured. 1938. Creswell Colliery. 2nd June, tub train accident, 3 died and a number injured. 1939. Warsop Main Colliery. December 20th, 1,850 ton of roof collapsed and crushed six men to death. 1949. Bolsover Colliery. April 15th, Mystery explosion, three men killed, two severely injured. 1950. Creswell Colliery. 26th September, fire, eighty lives lost. Derbyshire’s worst pit fire. 1973. Markham No2 Colliery, 30th July, cage accident, eighteen lives lost, twelve severely injured. 21st. November 1857. On the Sunday morning prior to this issue a serious incident occurred resulting in the death of 12 men and serious damage to property at the Staveley works. 9th. January 1858. Killamarsh Colliery. 4 men killed. Winding rope broke chair plummeted 70 yards to the bottom of the shaft. 23rd. January 1858. Clay Cross No3 Tupton Colliery accident four men killed when rope broke. 22nd. May 1858. Accident at Birdholme ironstone pits. Four men killed. Appears to be a shaft incident. 26th. June 1858. Birdholme Colliery. Inquest into death of Thomas Kenney who fell down ironstone shaft. 16th. March 1861.Abbeydale Ironstone pit Cutthorpe. Burial of miner Sunday previous. Accident in which Miner Thomas Watkinson was thrown down pit. 15th. June 1861. 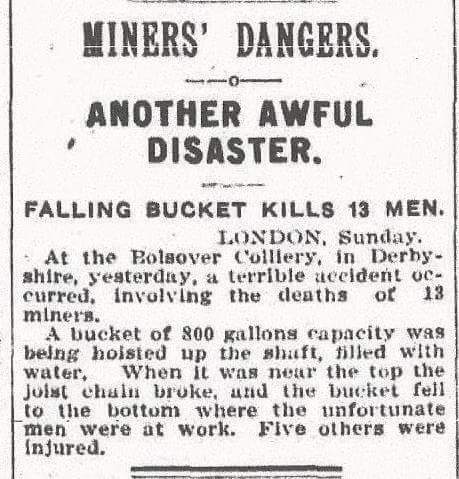 About 30 lives lost after an inrush of water from old workings at Clay Cross Blackshale No2 colliery. 21st. March 1863. Inquest into the death of 19 year old Foxley Oaks miner George Shemwell who fell down the shaft on 2nd. March. 15th. August 1863. Hunger Hill colliery. Previous Saturday the rope broke on the cage whilst descending the shaft, 20 yards from the bottom. John Stokes and John Heston were killed. 26th. December 1863. Inquest into Lings colliery boilerman William Gilbert killed when a pumping engine boiler exploded at Williamthorpe colliery. 28th. May 1864. Clay Cross No4 Main pit two men burned and later died in hospital. Michael Flannery and Thomas Garvey. 13th. August 1864. Inquest into mans death at Old Hollingwood colliery the day before. 3rd. March 1866. Grassmoor colliery at Corbriggs fatal accident to Joseph Lowe. Killed after tub ran into him and pushed him onto a prop handle. 16th. January 1869. Boiler exploded at Clay Cross Timberfield colliery. Two men killed and five scalded. 28th. December 1872. John Marples found dead at the bottom of the Hundow colliery pumping shaft at Apperknowle. 7th. October 1871. First accident ever at New Brampton colliery. 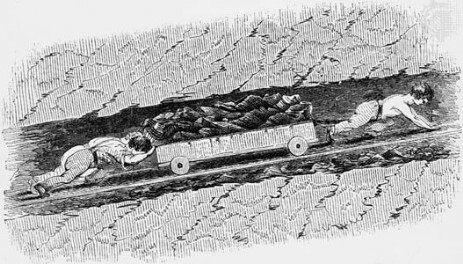 William Bradshaw fell into shaft sump and drowned. 28th. October 1871. Explosion at Wallsend colliery caused by a candle igniting gas. 19th. August 1876. A boy named Stephenson was killed when he was flung from the tub he was riding in at Do-Well colliery. 15th. May 1880. Thomas Ash of Newbold killed at Dark Lane colliery whilst engaged in coal cutting. 25th. September 1880. Inquest held into the death at Cobnar Wood colliery of Frederick Stevenson who died whilst drawing a tub of coal by winch. 2nd. October 1880. Fall of bind killed a youth named Jennings and a pony at Cottam colliery Barlborough. 2nd. January 1886. On Christmas eve Mr. John Harrison secretary and manager of Boythorpe colliery was killed in the fog by a small colliery shunting engine. 8th. October 1887. Office boy Edward Turner aged 18 run over and killed by a shunting engine in Glapwell colliery yard. 12th. May 1888. Frederick Buxton aged 34 years, a deputy at Albert colliery Newbold was killed by a roof fall. 25th. August 1900. Inquest into the death of a miner Thomas Burton at Alma colliery. 15th. December 1900.Inquest into the death of Joseph Platts aged 26 of Highfield colliery by a fall of roof. 12th. April 1919. Explosion at Oxcroft colliery. Claimed six lives out of the 74 workers on the shift. Not sure where this is from but if I find the Author I will credit him or remeove the article. The colliery was worked by the Oxcroft Colliery Company, Limited, Bolsover, near Chesterfield. the agent for the colliery was Mr. George Anderson with Mr. R.M. Percy, the certificated manager who had been in charge of the colliery for only ten weeks when the explosion occurred on the 6th. April at about 12.30 p.m. in the No.1 or Creswell District of the High Hazel Seam. Mr. James Brailsford was the undermanager. The colliery had two shafts, a downcast and an upcast, both 495 feet deep to the High Hazel Seam which was about three feet thick. The Creswell District was a cul-desac about 800 yards long by 60 yards wide, worked on the longwall system to the rise with gates about 15 yards apart. The Mine Level was an endless rope engine plane and the coal face between 80’s and 90’s gates had been standing for some weeks and about 50 or 60 yards back from the level had been fenced off for some time because of gas. The longwall face was worked by electrical coal cutters and the level had been extended from time to time by a heading machine which was also electrically driven but on the day of the explosion electricity was used in the Creswell Level only for an auxiliary fan. The ventilation of the colliery was from a fan at the surface of the upcast shaft which normally produced 34,000 cubic feet of air per minute at a water gauge of 2.3 inches for the 642 men normally employed in the mine. Of this quantity, 5,760 cubic feet branched to the Creswell Level at a pint where the road branched of the engine plane about 500 yards from the pit bottom and where 50 men were normally employed. On the 7th. March, 517 of the 5,760 cubic feet were passing 60 yards from the face of the level heading. In addition to the main fan there was a small auxiliary fan some distance along the Creswell Level which was sin the intake airway and the return for a considerable length went along the coal face. There were only single doors in the gates and the air was often short circuited during the working shift by the tramming of coal through the doors to the Creswell Level. Mr. Mottram commented- “In these circumstances the layout of the entire district at the time of the explosion was not in accordance with best mining practice, as with a fall of roof on the face the air could not be coursed down one gate and up the next past the fall, thought it should be stated that according to the evidence at the inquest, the extension of the counter level, by means of crossgates, was contemplated by the management.” Electricity was used underground at the colliery for lighting, pumping and coal cutting. The current was three phase at 440 volts carried by armoured cables and used by different circuits on or near the face for coal cutting and diving auxiliary machinery. On the day of the explosion and auxiliary fan was installed in the Main Level between gates 27 and 28 and another, smaller fan, which been removed the previous month from the level at 88’s road, was moved further along the intake on the morning of the disaster and this work was completed or near completion when the explosion occurred. This fan was driven by a 10h.p. motor controlled by switch gear formed of a coal cutter gate end box adapted for the purpose. Firedamp had been occasionally found in the workings and both safety lamps and electric lamps were in use. Firedamp was last found in the workings on the 4th. April but was removed after falls of roof were cleared the day before the disaster. After an inspection on the day of the disaster, the fans were switched off and not switched on again until about 7 a.m. on the morning of the explosion. A certain amount of coal dust was produced by the coal cutters and the Creswell Section was dry with the exception of some pools of water on the low side of the Main Level near the face. There was not much coal dust and it did not pay a prominent part in the disaster. On the morning of the explosion, 75 men descended the pit between 6 and 6.30 a.m. Of these only 21 went to work in the No.1 Creswell section. Among these men were Samuel Barke, and electrician and his assistant, Eli Hunt who were there to supervise and assist in the removal further inbye by a small electrically driven auxiliary fan in the Main Level. The remainder of the men were to do cleaning up and repair work which was usually done on a Sunday. The deputy for the section was Elisha Whitehouse and he, instead of descending earlier than his men to make an inspection of the workings, as was his custom on weekdays, descended about the same time at the station which was near the pit bottom. He instructed the men to walk on the Main Level where he later joined them and admitted them to the further inbye after making his inspection. Whether he found the whole of the workings clear of firedamp, there was no way of saying as Whitehouse made no statutory report and was killed in the subsequent explosion. The fan to be moved was that had worked in the level and it was intended to move it to 90’s gate, nearer the face of the level. In addition to this fan there was another auxiliary blowing fan working in the level near the bottom of 28’s gate and this was to assist the ventilation beyond this point. to make this fan operative, a door was placed in the 28’s level at 28’s gate and air was forced through the aperture and taken forward in pipes. if this door remained closed when the fan an was blowing, an effective current was produced through the pipes but if the door remained closed when the fan was stopped, the air course was practically closed and no appreciable current would pass beyond that point. It was the practice to stop the fan at the end of the shift on Saturday and to prop open the door so that a current of air could circulate freely in the level beyond by the aid of the surface fan alone. The clearest account of what happened in the level after work started on that morning was given by William Brailsford, one of the men who was inured, who, along with William Clark was gobbing in 28’s gate near to where the fan was being installed. It seemed that when they started work at 7 a.m., the fan was not running but Eli Hunt, the assistant electrician, soon came and started it and it continued to run for about two and a half to three hours, when it was temporally stopped by Hunt so that the other fan could be disconnected from the circuit. The door was left closed. During this time several men went through the door and left it closed, apparently without realising the danger. About 12.15, the deputy who had been inspecting other parts of the workings, arrived at the scene and was very concerned to find the fan stopped and the door closed. He immediately exchanged his oil lamp for an electric lamp and passed through the door in the direction where the fan was being relocated. immediately after this Hunt started the other fan and he and Barke, the electrician, followed Whitehouse into the level. A few minutes after, not longer than a quarter of an hour, the explosion occurred. Th blast came outbye from the direction of the relocated fan and it was later discovered that the explosion had taken place somewhere in the neighbourhood of 87’s or 90’s gate. News of the disaster reached Mr. Mottram, the Inspector by telephone but as he was ill in bed, Mr. H.A. Abbott, the Senior Inspector but later Divisional Inspector for the Midland and Southern Division went to the pit with all possible haste, descended and helped with the rescue operations. Meanwhile rescue teams arrived from various stations and with the aid of the officials and the men on the spot and the assistance of local managers and miners’ agents, everything was done to recover the bodies and attending the injured. The conduct of these men was highly commended in the report. The men who died were- Samuel Barke aged 25 years, electrician, Eli Hunt aged 35 years, assistant electrician, Elisha Whitehouse aged 52 years, deputy, James Taylor aged 31 years, stallman, John Chappell aged 26 years, stallman and George Randell aged 31 years, stallman. Those who were injured- Frank Hallam aged 34 years, stallman, William Clark aged 43 years, ripper, Steven Barlow aged 29 yrars, roadlayer, George Stones aged 34 years, roadlayer and William Brailsford aged 29 years, ripper and timberer and Thomas Longden aged 42 years, overman who suffered from carbon monoxide poisoning during the rescue operations. A thorough inspection of the day of the explosion was impossible because of inflammable gas and afterdamp but on the 8th. April a thorough inspection was carried out by Mr. Nelson, H.M. Electrical Inspector of Mines and Mr. Abbott. The region of the explosion was found to have been confined to the inner half of the level and a few of the gates branching off it. The force of the explosion was found it was outbye of 87’s gate bottom but in 87’s till 90’s gate where it was inbye. The force was noticed up the gates towards the coal face in the gates from 90’s back to 84’s. In 83’s there were distinct indications of force both ways. It was considered that coal dust had played very little part, if any, on the explosion and inquiries were directed to consider the possible sources of ignition. No blasting had been done and all the lamps were found to be in good order and these sources were eliminated. As electrical apparatus was installed between 88’s and 91’s, special attention was directed to see whether this was the source of ignition of the firedamp which apparently had accumulated in the level. The first inspection was made by Mr. Nelson accompanied by the manager, Mr. Percy, Messrs. Hall and Lee of the Miners’ Association, the managers of several local collieries and some others. Mr. Nelson described what he found at the inquest- “I went down the engine plane and then along the level and the first thing we saw was the site of the smaller fan before it had been removed from 25’s. We went further and saw the larger fan in it present position at the bottom of 28’s. We went a little further to the bottom of 81’s gate, and then Mr. Brailsford, the undermanager, went on with a canary in order to test the quality of the air with a lamp, and it was reported that there was gas present. After Messrs. Brailsford, Percy and Abbott had gone forward and the air reported sufficiently cleared, the whole party advanced with electric lamps. We saw the indications of force. my chief mission was to inspect the electrical apparatus and to offer an opinion as to its condition, or as to whether sparking had occurred. I got to the switch which operated the fan between 90’s and 91’s and was told it was there for me to examine. I gathered that no one had disturbed it since the rescue men had brought away the bodies of Hunt and his mates. I found that the switch handle was partly in and partly out. Further, that the switch cover was not properly fastened down. I drew attention to these points and then with the concurrence of everybody I opened the switch box. It was then seen, I was in the best position to see, that the switch was making contact in part, and in part only. This is a 3-phase system and there were three blades in each switch. Two of these three blades were making contact but the third was not making contact. This was clear, it indicated to me that the switch might have been in the course of being operated. If the switch had been in the process of closing or opening, there would have been sparks and the fact that the switch cover was not properly fastened down would make that spark open to the outside air. Such a spark would ignite and explode the mixture. The cover should have been bolted down but this may have been due to the fact that the job was not finished. Another point is where the cables led to the switch box, there were three holes which were five eighths of an inch, only leaving one eight or so around the cable. I left the pit with the impression that there might well have been some opening at that spot. 1. That Whitehouse was skilled between 84’s and 85’s gates from the force of the explosion Hunt, Chappell and Randell from CO poisoning in the Level at 90’s gate Taylor in the Level between 28’s and 29’s gates and Barke at the coal face in 28’s stall both from the force of the explosion caused by an electric spark igniting gas which had accumulated in the district, but we are unable to fix the definite point of origin, but the probability is that it occurred in the switch box in 87’s gate. 2. The jury are of the opinion that the Coal Mines Regulation Act should be strictly adhered to on Sundays as well as other days. We also think that all switch boxes should be inset, and we are also of the opinion that the crossgates should be completed as soon as possible and thus obviate the necessity of using auxiliary fans. We are unable to fix the blame on anyone.” As a result of the investigation proceedings were taken against the following officials of the mine, Mr. George Anderson, Agent, Mr. Robert M. Percy, manager and Mr. James Brailsford, undermanager for violations of the Coal Mines Regulation Act. The cases were heard at the County Court in Chesterfield but no convictions were obtained. After the disaster the electrical apparatus at the colliery was improved to include subcircuits. Counter heads and crossgates to act as independent return air courses, were constructed and the use of auxiliary fans discontinued. Additional air doors were provided in the gates to conduct a larger quantity of air to the inbye workings. (I reported on this incident for BBC Heir Hunters a few years ago).